This article outlines how to convert Pose Presets to the .DUF format. It is important to determine what the creator of the original pose preset intended, before you save the file. This article specifically covers converting poses from an older file type (.dsa/.dsb/.ds/.dsf) to the new .DUF format. Morphs: There are essentially 2 different kinds of morphs used in DAZ Studio: Shaping and Posing. When reading the definitions below, imagine giving an actor instructions. Shaping Morphs: Morphs that apply shape changes that generally wouldn't be possible for an actor to do. For instance, you can't tell an actor that their nose needs to be bigger or they need to gain weight right that instant. Posing Morphs: Morphs that would be possible for an actor to do. For instance, make an angry expression or close their eyes. 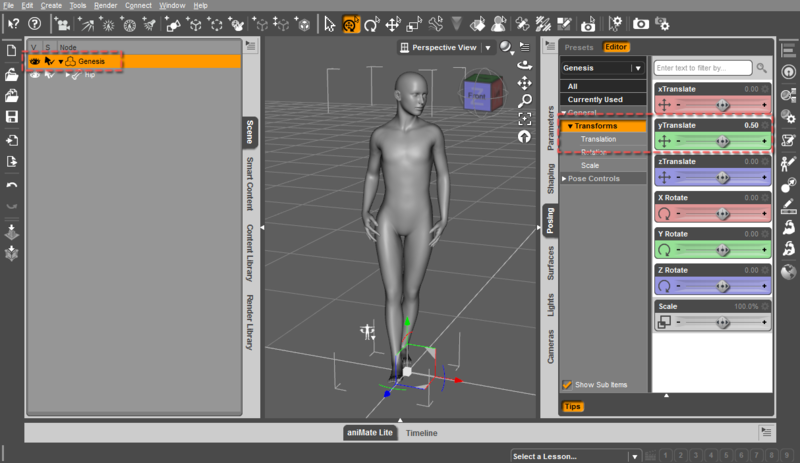 Posing Morphs, relating to Expressions on Genesis, can be found by selecting the head and looking under the “Pose Controls” group. Other Morphs can be found when the full Genesis figure is selected. Root Figure Node: Sometimes referred to as the “Figure”. This is what you see listed at the top of the hiearchy in the Scene Pane, with the bones of the figure shown as children below it in the hierarchy. This document assumes the poses are being saved for Genesis, so the Root Figure Node is “Genesis”. Full Figure Transforms: The figure can be positioned by either moving the hip bone or the root figure node. It is preferred to do the full figure transformations on the hip so that users will not lose any positioning of the figure in their scene they may have set up before applying a pose. Poses are built for specific models. Load the model the poses are built for into DAZ Studio. Does the pose affect most of the nodes on the figure, or just a few? Is the pose meant to move the figure to a specific location in the scene or leave the figure in its current position? Are the posing morphs meant to be included? Click the + button in the lower left-hand corner of the Content Library and choose “Pose Preset…” You will be able to choose your save location, and name your file. Close the dialog and make sure that Full Figure Transforms are not on the root figure node. If they are, they will need to be moved to the hip. Best-case scenario, this can be done simply by copying the value of the transform on the root figure node (ie. Y Translate), zeroing it, and pasting that value on the hip bone's corresponding property. In some cases, transferring the settings to the hip does not give the same result as the original so it will be necessary to just do your best to approximate the results. NOTE: Using the “Drop to Floor” action will apply the translations to he root figure node, so it can not be used. Any adjustments to the hip will need to be done manually, and not with the action. Expand the tree view to Hip → Abdomen → Abdomen 2 → Chest → Neck → Head → Pose Controls and uncheck the Head group. This is to remove the most common Posing Morphs from the pose preset. NOTE: There may be poses that are intended to include the Posing Morphs on the head. If this is the case, skip this step. The majority of poses, however, will most likely require it.